At 9:00 a.m. on the morning of the 26th of April 1979, our undaunted troop of fresh-faced ExPat voyagers grabbed a Saudia flight in Dhahran and flew to Jeddah, where we encountered a planeload of pilgrims from Pakistan, all dressed in white, scurrying through the terminal on their way to Mecca for the Hajj. From Jeddah, after a brief stop in Beirut, we proceeded on to Istanbul, where Mike Ghiglieri greeted us. From Atatürk Airport we hastened to the city’s Beyoğlu district overlooking the Golden Horn where we checked into the Pera Hotel featuring large guest rooms and, especially impressive to me, spacious bathrooms bigger than most of the hotel rooms I’d ever stayed in. Following an entire day spent playing tourist in that glorious city highlighted by stops at the Blue Mosque, the Hagia Sophia, the Bosporus, the Golden Horn, the Grand Bazaar, and Topkapi Palace, we grabbed a Turkish Airlines flight the next morning to Ankara, the nation’s capital, where our interpreter, Vic Dewey, joined us. There we switched planes for the 400-mile flight to Malatya, capital of Malatya Province, set on a high plateau in the Eastern Anatolia region. At Malatya, we clambered aboard a rickety bus that bore us the final miles to our ultimate destination, the Euphrates, known in the Turkish language as the Firat. 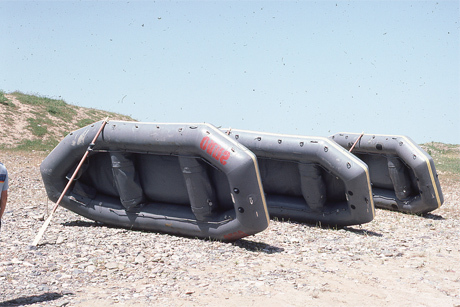 On its west bank, we joined forces with Dan Dierker, Dave Hinshaw, and the three 16-foot Avon Professional inflatable river rafts that would carry us downstream. The two trial-tested rivermen had spent the past week buying local supplies, building rowing frames, and rigging the Avons, evidence of the careful, meticulous planning that had been done beforehand owing to yeoman efforts by Charlie Franck, Richard Bangs, and Sobek Expeditions. “Everything’s ready to go!” Dan and Dave announced proudly as we shook hands and prepared to launch. 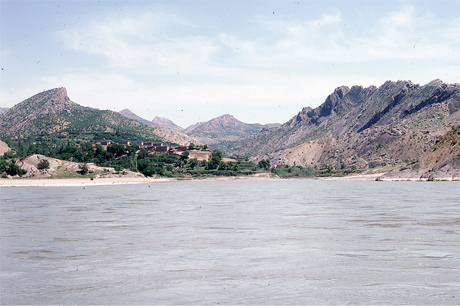 The land between the lower reaches of the Euphrates and its sister stream, the Tigris, is commonly referred to as “The Cradle of Civilization.” From the dawn of civilization to the rise of the modern world, the “country between two rivers”—a literal translation of the Greek word Mesopotamia—was visited upon repeatedly by an endless procession of conquering armies: the Hittites, the Egyptians, the Chaldeans, the Persians, the Seleucids, the Parthians, the Greeks, the Romans, the Muslims, the Byzantines, the Mongols, the Ottomans. Significant strife along the lengths of the two rivers continues to bloody their banks to this day. Yet, through it all, civilizations have risen in their environs and the people and land and rivers have endured, though not without changes large and small. In ancient times, the lands flanking the banks of the Upper Euphrates were home to many prosperous cities, Malatya being one of them and one of the few that continue to be inhabited to this day, several iterations and over two millennia later, each new, reborn urban center layered in succession over the remains of its predecessors. This, too, is the land through which major trade routes once ran, connecting east and west, and where one of the truly notable rulers of the classical age once reigned: Mithridates VI, the Great, King of Pontus and fearsome scourge of Rome in the days of Julius Caesar. In this land so rich in thousands of years of history, in our time the mighty Keban mega-dam bespeaks the modern day world of machines and technology and mankind’s boundless, endless determination to master his surroundings; the semi-nomadic Kurdish tribes, crumbling ruins, and soon-to-be-submerged villages and habitats we encountered downstream from its thundering spillways hinted in contrast at what life must have been like in the pre-industrial age when Mother Nature still held sway and mankind endured in uncertain awe of her might. 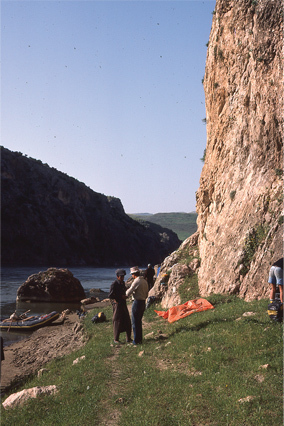 In 1901, noted American geologist Ellsworth Huntington successfully traversed the Upper Euphrates above and below Keban in an elaborate five-man kellek—the inflatable boat of its day —essentially a platform mounted on a light frame of saplings kept afloat by 30 inflated sheepskins carefully lashed together beneath the framework. We Aramcons were about to test our mettle in those same canyons and V-shaped valleys aboard sturdy workhorses of rivers the world over— a trio of Avon inflatables, arguably a quantum jump upgrade over Huntington’s no-tech artifact from ancient times fashioned for lack of rubber or anything better from the inflated skins of 30 dead sheep. Nonetheless, their solution worked admirably, a powerful testament to timeless ingenuity at its best. Given a problem, those “kellekjis” as Huntington referred to his boatmen solved it using what materials and tools they had at hand. Necessity, it is said, is the mother of invention, on the Upper Euphrates as much as anywhere else. We packed our food and the bulk of our belongings into rubber waterproof bags reminiscent of tire inner tubes. For mission-critical items and valuables such as cameras, film, passports, and the like, we employed metal ammunition cans. 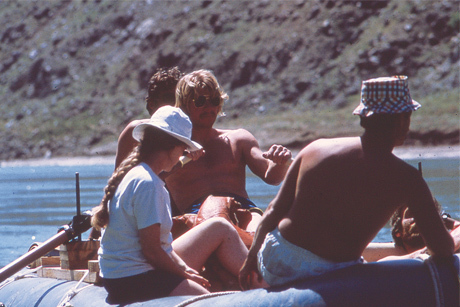 Loading the tubes and cans into three sturdy rubber rafts, we lashed them down and climbed aboard. We all had life jackets with us, but rarely wore them for the first day or so, not until we faced serious rapids. And none of us donned helmets the entire trip; nobody had thought to bring any. 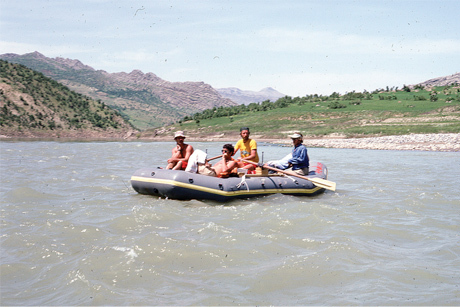 With a large crowd of curious Kurds watching, the more cautious among them warning us of the life-threatening dangers we were about to face, Mike and Dave and Dan assumed their seats amidship atop their two-foot-by-six-foot rowing frames, while a pair of us climbed in the bow and another pair in the stern of each raft. Expertly wielding their oars, the trio eased the ungainly craft into the lazy sapphire blue current beneath azure skies and we leisurely commenced floating southward in search of adventure. For an unforgettable five days and four nights, adventure we would find in great abundance. “Someone’s worried about security,” he half answered, and I took him at his word, not realizing there was much more to the story than that. Ignorance left me blissful for the time being. At that moment, Mike stood up on the sagging floor of the raft, waved in an exaggerated, overly-enthusiastic fashion, and shouted “Merhaba!,” Turkish (and Arabic) for “Hello!” People in the other two rafts did the same. I let it go at that and quickly forgot about the incident. 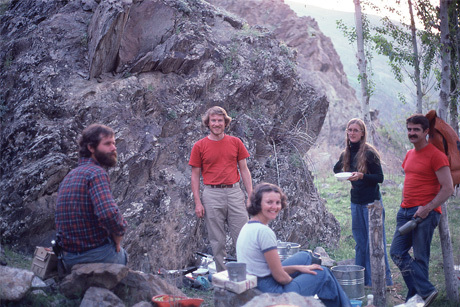 We were entering fabled Kemer Khan Canyon, and that required my and everybody else’s full attention. Large dams have significant environmental consequences upstream and down, short-term and long, near and far, and the Keban was no exception. 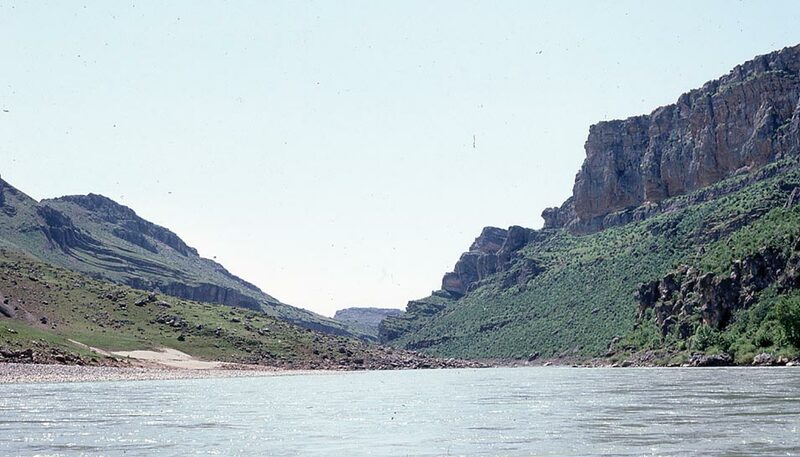 It acted as a barrier against both the flow of water and the spreading of the silt the Euphrates had been carrying southward from its headwaters since time immemorial. That led to a build-up of silt behind the dam, to clear, relatively silt-free water tumbling down its spillways, and to less replenishing silt being spread via seasonal overflows on the riparian lands through which the stream flowed on its long journey to the Arabian Gulf, lands like those along the banks of the Lower Nile in Egypt that depended on annual deposits of such silt for their sustained fertility. At the top of Kemer Khan, we had our first encounter with the rapids Helmuth von Moltke and Ellsworth Huntington had described so vividly. 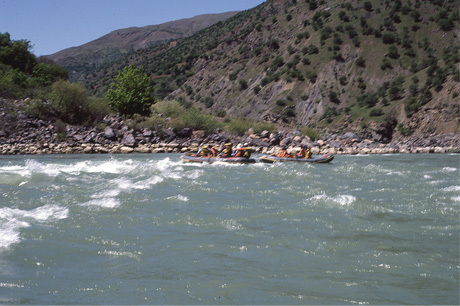 Our three guides easily mastered them, not to worry, and the Euphrates’ swift waters provided us with our first real taste of the aquatic thrills we’d come so far to experience. Yee-hah! Knowing Mike and Dave and Dan were firmly in control of our descent left the rest of us confident we had little to worry about, so we devoted our attention to soaking up the sunshine, ogling the scenery, and fancying ourselves masters of the realm. In a time when sunblocks with high SPF ratings were not nearly as popular as they are today, we all were sporting lobster-like sunburns by the end of the first day. Putting ashore early that evening on the east bank of the river seven-and-a-half miles downstream from our point of entry—in the identical spot where Huntington’s party camped in 1901—we quickly settled in for the night and later sat around a campfire reliving the day’s highlights. Firewood being scarce, we fed the flames with what little wood we could gather together with bricks of dried cow, sheep, and goat dung in the same manner the locals did. Aromatherapy, Euphrates style. Several of us had purchased Turkish wine in Istanbul, consciously, carefully selecting local varietals with histories dating back thousands of years. We could sip sauvignons and merlots and cabernets anywhere. But this was Turkey, not France or Napa Valley or the Piedmont, and we decided to add to our sense of adventure by trying indigenous styles new to us—reds made from Öküzgözü grapes grown in Elazığ and Boğazkere grapes grown in Diyarbakır; and whites made from Misket grapes grown around Izmir and Emir grapes grown in Central Anatolia. Adjusting our palettes and expectations to unfamiliar interpretations of the grape, we were much pleased with the results. Each wine had its own distinctive taste and character and color, which made them all that more interesting. Victor, meanwhile, had brought along a bottle of Greek Ouzo. Shots of that anise-flavored elixir, coupled with glasses of our Turkish wines, fueled much bonhomie among us, and by the end of our first night on the river we had already declared our trip a success. The countryside reminded Ken of the Snake River/Magic Valley region of southern Idaho. The time of year was late April, and the spring melt from the slopes of the Armenian Highlands and Taurus Range was nearing its apex. That explained the bone-chilling cold of the water, the size and ferocity of the rapids awaiting our arrival to the south, and the verdant growth lining the banks. Later in the year, when the withering heat of summer has gripped the land, much of the vegetation that was fleetingly green in spring turns a lifeless brown. The Keban dam changed all that when it harnessed the Euphrates’ flow, assuring water for year-round irrigation, decisively altering the rhythm of the seasons, and transforming forever the local people’s way of life. 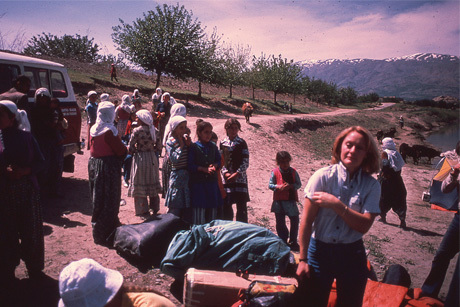 An overwhelming majority of those people were ethnic Kurds, members of one or another of six hundred-plus Kurdish tribes clustered into more than 60 extended clans and scattered across a trans-national, geo-cultural region encompassing parts of Turkey, Syria, Iraq, Iran, and what was then the Armenian Soviet Socialist Republic, a member of the now-defunct Soviet Union. Clashes between the Kurdish population in eastern Anatolia and the Turkish government in Ankara, and with the Ottoman government in Constantinople before that, have been endemic to the land for centuries and continue to wreak suffering yet today. The strength of character demonstrated by the peoples of the Euphrates through the ages is perhaps the region’s greatest history lesson for the rest of the world to learn from. 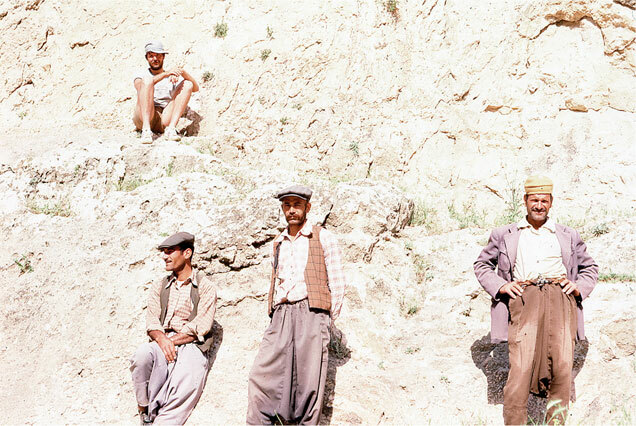 The river dwellers we met were a variegated mix of Zazas, Kurmans, Kizilbash, and other Kurdish tribes speaking an intricate mélange of dialects—at times at odds with the accustomed lingo of a clan abiding in the next valley. Complicating matters further, more than once, the interlocutor of the moment spoke little to no Turkish. The side of the river on which you stood largely determined which dialect you could expect to hear being spoken at any particular time. Wielding his more-than-serviceable Turkish, Vic strove mightily to communicate with the mix of Kurds we encountered, but more than once we had to resort to sign language and pantomime to bridge yawning language gaps. Linguistic differences aside, the Euphrates locals we met were overwhelmingly ethnic Kurds and generally warm-hearted and welcoming toward us, this despite the fact that the loyalties to the government in Ankara of some amongst them were problematic at best. Our venture into the innermost depths of the Upper Euphrates and Taurus Mountains imbued in me an appreciation of the river’s importance as an incubator to a succession of civilizations, starting at its headwaters in northern Turkey and extending 1,700 miles from there all the way to Mesopotamia and on from there to its marriage with the Arabian Gulf. 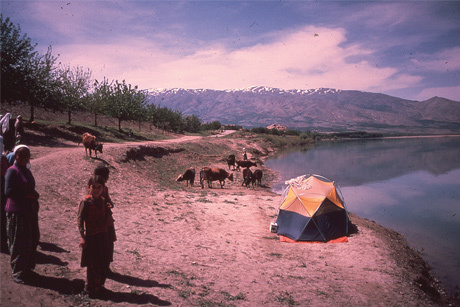 The reservoir above Keban dam drowned a widespread patchwork of mud-walled, flat-roofed villages once home to Kurdish tribes. More dam-induced waves of change would soon follow in the waters below. For a good part of our journey, we passed through micro-worlds of man and nature perched on the cusp of being washed away.